Part of the show What Makes Mucus Green? Now try bashing it really hard, does it do what you would expect? You should find that if you hit the balloon gently it flies across the room and slows down gently. If you hit it really hard though it moves very fast for a bit then suddenly slows down or changes direction. If you hit the balloon gently the air will flow around it, there will be quite a lot of friction compared to the mass of the balloon so it will slow down gently. The air just flows around the balloon slowing it down gently. 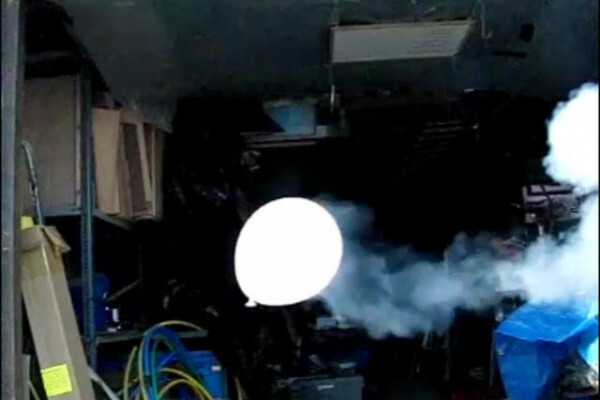 If you bash the balloon really hard you are not just making the balloon move fast you are also making the air around it move fast, and there is actually more energy in the rapidly moving air than in the balloon itself. While it is going fast the balloon seems to drag (or be pushed along by) a chunk of air behind it (which the smoke allows you to see), this seems to be circulating slightly, a little bit like a smoke ring. After a little while and as the balloon slows down a bit this arrangement gets unstable and the air behind the balloon becomes more unstable and pushes past the balloon, entirely changing its direction and sometimes pushing it backward. If the balloon is going fast it starts off with an area of turbulent air behind it which seems to push it along. At some point this becomes unstable and the balloon falls off the turbulent air and gets pushed sideways or backwards by it.